Wine Lovers, we have the perfect conversation table for you! This item can be customized to your specifications, made taller, shorter or longer. 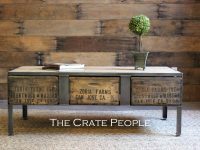 -Our furniture pieces are made by hand of reclaimed barn wood. The beauty of reclaimed wood is that no two pieces are exactly alike! So there may be very slight differences in hue or texture from what is pictured. The overall tone will be the same as what you see in the photos. Finish: Fresh coat of polyurethane for the wood top and rubbed on oil urethane for the metal frame – we lightly sand the wood top so it is soft/pleasant to the touch. This also elegantly exposes the character and beauty of the circular sawn mill cuts and wood grain.